I love to worship inside of the temple. I noticed in my scripture reading this week, that the sealing power of the priesthood--or in other words, the power to seal families together for eternity--is mentioned twice in the first two sections of The Doctrine and Covenants. That is pretty significant to me. The Old Testament prophet Elijah has returned to the earth. He did what it was prophesied he would do in the Old Testament: He restored God's sealing power--the power that would "turn the hearts of the fathers to the children and the heart of the children to the fathers,"--to the earth. Visiting the temple yesterday reminded me that God cares about families. He doesn't just stop at sealing us together, like it's a one-time-deal. He invites us to return to the temple again and again to receive invaluable personal instruction on how we can strengthen our families and be happy together on earth and eternally. He send prophets to warn us of evils in the world that would destroy our families. The church is always presenting ways for us to build up healthy family relationships: family home evening, The Family Proclamation, urging us to hold daily family prayer and scripture study. Why? Because the Lord wants ALL FAMILIES to remain intact. He wants ALL PEOPLE EVERYWHERE to return to him along with their families. Because he knows that the adversary of all men would like to dismantle what the Lord has joined together. If you have a question for me about temples or what Mormons believe about the eternal nature of family, either comment here or email me! Please feel free to share your feelings or testimony of temples in the comment section below. Tell me: Why do you love to see the Temple?? How has temple service strengthened you or blessed your life? Visiting the temple give me a little mental health boost that I need. I did sealings last week and I love the words about the children and all the children "as if they were born in the covenant." Powerful stuff! I love seeing the temple from the bus on the way to work each day. I caught a glimpse of it the other week, got so excited inside, and I now look for it every day. It is such a great symbol of peace, purity, and holiness. Oooh lucky you!!! That is neat!!! For me, the temple has been more of a cumulative experience. I have found that, after years of regular temple worship, my life has been strengthened. One way that I was strengthened recently was when my brother passed away. He was not a member of the church. He was only 18, and died in a freak-accident. When I was told the news, I went to pray, and instantly I knew and was comforted by the fact that I had done so much of the work for my own family. He wouldn't be alone. They were praying for us. My parents are divorced, and my father is not Mormon. I've never really had the comfort of knowing my family would be together forever. This experience - at the death of my brother - was one of the first times I realized that my family could be together forever. I had a similar experience when my brother who had left the Church passed away after a 9 month battle with cancer. It was hard for me when people would say that whole "families are forever" thing to try and comfort me. 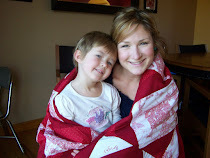 At first, I refused to be comforted - my brother had left the Church after his mission and it was hard for me to believe that we would be with him again. After a few great lessons at Church and some prayer in the temple (that's the short story) I finally realized that we will be with him again, despite the decisions he made in this life. There is so much more time than just this life, and I pray every day for his heart to be softened still. I think that is my favorite thing about the temple. They are a symbol of our unwavering belief that there is life after death. There is something when we leave this life, and it is beautiful. 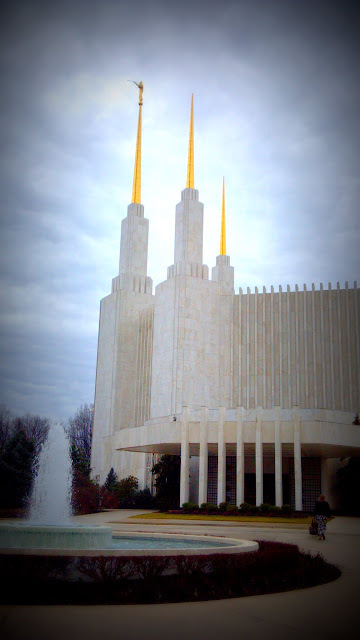 THANK YOU for posting the picture of the DC temple. I was married there just over 10 years ago, and then I was whisked away out west by the California boy that I fell in love with. We have only made it back there one time, but I have pictures of that temple all over my home. I love the temple (ANY of them!) because I truly feel at home there. I'm always sad to leave and go back to the real world. I love the temple too. It has been a sweet opportunity in my life to be able to serve as an ordinance worker for the past 9 years. We work Saturday mornings and it is my favorite morning of the week. The temple brings great peace into my life. My husband and I have been deeply blessed by temple covenants. I loved your thoughts and testimony on the temple. I love that you can be anyone dealing with anything and still be involved in the Temple. Because of my anxiety issues, doing a typical session is very difficult for me. But I can still participate in the vicarious work by doing other necessary ordinances for those who have gone before. I still am able to participate in the blessings of the Temple and the peace that I find there. I also love that we are equal. Because of where I live, I've seen people who range from the more well known and possibly famous to the financially poorest among us. And they look the same. They are all beautiful and shining and lovely. I love how the Temple equalizes us and helps us to see that we are all brothers and sisters. Beautiful picture of the temple. My life would be so different without temples. There is no peace like the peace I find in the temple. Having just gotten my endowments out and been sealed in the temple about 6 months ago, everything is still fresh and new to me! I went through my first proxy sealing session a while ago, and the spirit is stronger there than anywhere else on earth. I was a loyal temple goer even before I had my full recommend - I miss the baptistry sometimes - and I love the peace it brings to my home.